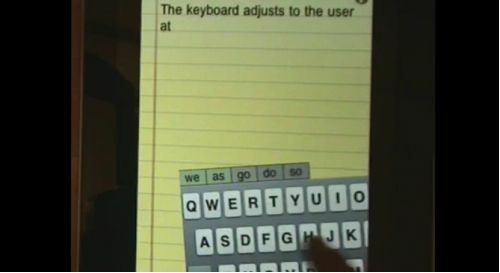 There are a few competing keyboards on Android and the iPhone at the moment: Swype, Shapewriter, Swiftwkey — and that’s just the ones beginning with S. But here’s one that’s tackling a problem I never thought software could tackle: Blind Type makes it possible to type on your touch screen phone without looking at the screen. You can do this because the Blind Type keyboard is no longer tethered to the bottom of your screen. In fact, you just type away anywhere on the screen — just like there was a keyboard underneath — and the app figures out what you meant. Luckily for you, these guys have a video demonstration, coz I’m having a Dickens of a time trying to explain it to you. Do me favour and watch the video, won’t you? While it’s not yet available, Blind Type are hoping to launch the keyboard on Android, iPhone, and iPad. If you’re keen (I know I am), make sure to keep an eye on their website for release details.